To start off my coaster season, I took a one day trip to Six Flags Great America with my college buddies Evan and Josh. We expected the crowds to be light, and we expected a relatively cold day, but it did not rain, and we were glad about that. Also, we knew that the Joker would not be open yet, but that was not a concern to me, as with my Six Flags Gold pass, I will have countless opportunities to ride the S&S 4D free fly models at Great America and other Six Flags parks. When arriving at about 10 AM, one thing to be noted was that there was many schools at the park. This was not a problem crowd wise, as the weather wasn't traditionally "great", but it just was rather annoying having middle school boys who cut in line throughout the day, rather desperate high school girls bugging us throughout the day, and general nonsense created by younger kids. The lack of college aged people and young adults at the park was rather noticeable as well. I'm curious about if Wednesdays in mid-may are typical days for schools to come to this park. One thing that was a massive positive over previous years for Six Flags Great America, and probably it applies to all Six Flags parks, was how easy it was to validate and get my season pass. When parking, all that was necessary was to have them scan my online voucher, and the employees knew exactly what was going on, and they were efficient and knowledgeable. Also, this time there was no need to get my pass validated at some season pass services booth or building outside of the park when I entered. Right at the entrance to the park was where I had to get my pass, and I had to scan my voucher, have them scan a blank gold pass, and then I could walk right in. Within an hour, my pass was in the system, and I could scan my pass on my phone and my phone had access to all my benefits, coupons, and also a virtual version of pass was available on my phone. I got my gold pass for under $100, and it was a great deal, and I greatly praise Six Flags for making this so cheap and easy. As for my buddies who were with me, they both didn't like how expensive their single day passes were, and I agree with them to an extent. It's obvious that a season pass, specifically a gold pass, is the premiere way to enjoy Six Flags. One thing to note is that although we got to the park a half hour before opening, we still had a rather long line to get into the park. However, we were able to get through the entrance by 10:20, and while all the kids in front of us were busy assembling, fighting over what ride to go to first, looking at the park map, and getting pictures taken, we headed straight to Goliath, the RMC wooden roller coaster in the park. We were one of the first people in line, and we got the back car on the first train of the day. This coaster is phenomenal, as it has one of my favorite first drops on any coaster. In the back car, the air time is intense, and the other elements on this coaster are all great. Unfortunately, this ride is rather short, and that is a shame, but I think it's still a great ride. It's my only RMC I have ridden, unfortunately, as my home parks are Six Flags Great America, Kings Island, and Cedar Point, but if Goliath is one of the weaker RMC's, then I'm excited to ride their other coasters. One knock on this coaster is its restraints, as I am someone with long legs, and the leg restraints it has is rather constricting to my body type. The ride itself isn't rough at all, but the restraints are a bit uncomfortable. My friends both enjoyed this coaster as well, and throughout the day, I continued to inform them about all the rides, as they are rather typical GP members. After we rode Goliath, we rode it again in the back once more, and we received another fantastic ride on it. One thing I noticed was that they weren't doing the single rider line for Goliath anymore, or perhaps they moved it, as I couldn't find it. Since the park wasn't very busy, this wasn't an issue, but I'm curious if anyone else has noticed that. Our next attraction of the day was X-Flight, and this was a ride I was looking forward to experiencing again. The last time I had ridden X-Flight, I thought the ride was rather sluggish and a lame coaster. I thought Gatekeeper blew it out of the water, and I never made it a priority to ride on future visits. In addition to that, I saw many advertisements in the queue, and I absolute hate when Six Flags ruins the theming on their coasters. On Goliath, they stopped playing the epic music in the queue for simple pop music and ads, on X-flight they put ads all over the queue ruining the military base feel, and on other attractions I saw this treatment. This is a disappointment, as I've always considered Six Flags Great America the most theme conscious park in the chair. Also, this is the queue that we experienced cutting in line. Unlike many attractions, the Flash Pass entrance for X-Flight is at the front of the queue right next to the normal entrance. People would enter through the Flash Pass queue, bolt ahead, realize they had made a mistake, and then climb underneath the bars and go in front of a bunch of people in line. This has been an issues almost every time I've been on X-Flight, and it really is just a pet peeve of mine. It didn't hinder my experienced, it just made me feel less guilty when cursing with my friends when I knew the kids could hear us. Anyways, one funny thing with X-Flight was that the kids didn't know that the left side of the train existed, it seemed. There was a point where the right side of the station was completely full, while the left side of the station was completely empty with just my friends and I. I rode front row, and I have to say that I was pleasantly surprised by how intense my ride on it was. The first drop was excellent, as that was my favorite part when I had ridden it previously. I just love how these wing coasters do those dive drops. The zero-g rolls were both great, but that Immelmann actually gave me some great forces, and in fact, my friend Josh even commented about how many g's it was pulling. During the inline twist and the final helix I felt a slight rattle, but for the most part, it was a very smooth ride, and although I think Gatekeeper is still better, I enjoyed X-Flight a lot. I rode it again in the back seat, and I'd have to say the front seat was better. I love the near miss elements on this ride, but it was good to get a back seat ride on the coaster for a change. Next was Justice League: Battle for Metropolis, an attraction I had never been on. I have to say that this is a fantastic ride, and I hope every Six Flags park get something similar. The fact that cars move and rotate the way they do was surprising and pleasantly so. The effects were good enough, and they felt more realistic than I expected. The mix between the 3-D screens and the physical effects were brilliantly done and entertaining. Unfortunately, this attraction's laser shooting portion was confusing, way too fast paced, and difficult to understand. It was kind of difficult to figure out where I was aiming, and I prefer shooting at targets rather than digital robots. I also got the lowest score of the three of us every time I rode it, so maybe I am just biased. One interesting thing that happened was that the ride broke down on the last shooting screen on the ride, and the screen went blank, but when we pressed our blasters, the whole video image would shine the color of the laser, so it looked like some sort of LSD trip or something. My friend Evan joked that the Joker's gas had gotten to us. We were stuck in the dark there for fifteen minutes, and there were three middle school children in our vehicle. Finally the ride ended, and we headed to Southwest Territory. We decided to skip Raging Bull until later, as it seemed like it had a long line, but now that I think of it, it probably wasn't bigger than fifteen minutes. We rode Viper in the back row with a one or two train wait, and it was solid. This ride doesn't provide as much air time as it used to, but it isn't bad, and it certainly is worth riding. The operators really don't push down the lap bar like they do on Goliath, so that is a plus. Next, we headed to the front of the park to check the waits for Superman and the Dark Knight, and both were longer than we expected, but we decided to ride Condor, a Huss spinning tower ride, and it was alright. Then we rode Batman the Ride with a 10 minute wait, and I still think this is a fantastic coaster. It's a bit rough, but nothing beats a great B&M invert with some great forces. We did the back row, and my friends also agreed that this coaster was quite intense. They also enjoyed the theming on this ride, and I agreed with them. The whole set up for this coaster isn't anything amazing, but it should be a baseline to how elaborately rides are themed at Six Flags parks. It's nothing special, but it's very cool, and it makes the queue more enjoyable. Next, we rode V2, and I find this ride pretty good. It's a ride I try to get on once per visit, and I like that the back tower is straight back. Free-falling straight down is a fun feeling, and it's why this is a must-ride attraction for me while Wicked Twister at Cedar Point is not. Then I got a funnel cake with my one dollar off coupon (yay for pass benefits!) and my friends ate some of it, and it was their first funnel cake. They loved it, and I almost got sick from it because I thought it was disgusting. Six Flags never fails to provide the worst food options of any park chain I've been to, but that's okay because their coasters are great. We rode American Eagle next, and they were only operating the red side. It was like a 10 minute wait, and a very interesting thing happened while next in line for the back car. The kids in front of us in line (we occupy two rows) were asked to get out of the train because they were suspected for sneaking on the ride in front of guests that were going to ride the ride and getting re rides. Obviously this is against park policy, but they honestly didn't even do anything wrong. We were the ones behind them, and we didn't tell anyone they did anything wrong, and they were about to get on at the time they should. They were publicly humiliated, and they were forced out of the ride, and then I guess it was our turn, but oh wait! There was a family with a handicap person taking our place. It looked extremely sketchy, and it's possible they were falsely accused just so the handicap family could get their preferred seat. Also, the kids were minorities, and the family with a handicapped son was a white family, and although I don't think there was any racism intended, it definitely didn't look right. And it happened right in front of us. Anyways, American Eagle was rather sluggish, but still rough, and it gave little air time. Honestly, this coaster could use some work or it could be demolished soon, as it takes up a ridiculous amount of space, and not many people ride it anymore. It's not bad, and I get nostalgic value from it, as it was my favorite coaster at the park when I was a short fella, but it's had it's better days. After American Eagle, we rode Justice League again, and I got demolished, while my friend Josh got top 5% of all time, and then we rode Giant Drop. Giant Drop had the VR treatment, and it was something I gladly and proudly refused. No way was I going to waste my ride on Giant Drop and my great view with some silly video game. I get why the companies do this, but putting VR on a drop tower is silly, and it is not my cup of tea. To my surprise, about 75% of riders refused VR, but my friend Josh tried it and liked it. I'm not against the concept, but I myself won't do VR unless it's on a crappy ride. After Giant Drop, we went next door to Raging Bull. After about a fifteen minute wait, we boarded our back seat, and I received a decent ride on Raging Bull. It has a strong first drop but a weak rest of the course with little air time compared to other B&M hypers, and as someone who prefers ejector air time to floater air time to begin with, Raging Bull besides its great speed and drop doesn't get me. It's a great ride, but it's definitely the weakest B&M hyper out there. One thing I do like about this coaster is how fast the operations are. They get you in and out of it fast, and they encourage you to get on it quickly. The employees have a sense of urgency on this attraction not seen on any other ride in the park. That was cool. Then, as we were leaving to our car to go eat, we rode Wizzer on the way out of the park, and my friend Evan and I sat in the same seat, and it was very snug. Wizzer is a fun little coaster, and although I don't know why many coaster enthusiasts think it's something special or elite, it's still a good family ride. For lunch, I ate a ham sandwich, chips, and some fruit, and we got in the park by 3:30. We rode the Dark Knight, and I was extremely disappointed by this coaster this time around. They weren't running the effects like they used to, the sounds weren't as loud, the pre-ride movie wasn't a forced thing anymore, the pre-ride movie (something I always enjoyed as a fan of the movie) wasn't as loud or cool anymore, and it was overall a completely sad experience. The Dark Knight was always a coaster I looked forward to and liked, and it wasn't the same. After this, we went and got on Demon, as we hadn't ridden it yet, and it was "meh". I love the lights and the tunnel it has, and the loops are intense, but it's a pretty basic arrow looper. Then we got another ride on Goliath, and we were surprised by how short a line it was. It was only fifteen minutes, and it was around 4:30. The operations on this coaster were better than previous years, and like earlier, it was running great. Then we got another ride on Batman, and it was rougher than before, but it was still pretty good, and then we went to Superman, which had a long line the whole day. To our luck, we only had a 10 minute wait, and we took the back row, and it was running fantastic. My friends did not know it was a flying coaster, and they were surprised and thrilled by the pretzel loop. And the pretzel loop was as forceful and fun as always. Unfortunately, Superman Ultimate Flight is kind of a one trick pony, but it's always worth a ride or two. We rode it again in row two with even a shorter wait, and it wasn't quite as intense, but it was still fun. Finally, to end our day, we took another back seat ride on Raging Bull. It was then 6 pm, and the park closed. It was rather unfortunate and somewhat silly the park closed that early, but we had ridden so much that it really didn't make us that upset. I knew it closed at that time previously. One thing I would've liked to do was use my $29.99 friend ticket that was provided for gold pass holders this week on one of my friends, but you can't access your benefits until you visit the park. $60 is a lot to pay for a park that's open 10:30-6. As a whole, Six Flags Great America is still a great park with a great collection of coasters. I think it lacks the insane top tier coasters that parks of a similar size like Kings Island and Six Flags Great Adventure has, but there is very few parks that have as diverse and deep of a coaster lineup. With many great flat rides, wood coasters, and steel coasters of many different varieties, Six Flags Great America is a great park even without that top tier coaster. It was a great day, and I encourage anyone to go to this park in May especially if they have a season pass, as we never waited longer than fifteen or twenty minutes for anything, and that was with it being a huge school trip day. All in all, it was a great way to start my season, and this park will always have a special place in my heart. I'm just gonna leave that there, Tyler. And laugh a little that that statement came from you. Otherwise, glad you had a nice time. Wait... that's Tyler Boes? Hahaha. I never made the connection. Either way, that was a great TR! Made me both nostalgic for the park I grew up with, and made me realize how incredibly long it's been since my last visit. I'll say this much about the old (read: younger) Tyler: I cannot ride Gatekeeper without thinking about your "I Love Camels" TR. I'm surprised how little this site has changed (and that's not a bad thing). And yeah, I don't consider MA a home park, even though it's probably the closest. I have family that live right near there, and when I go there these days, it's just for a relaxing day with them. I was wondering if it was you, Tyler. Welcome back, and your "voice" has definitely changed. I'm kinda chuckling now. Really great in depth trip report. I'd really like to check out Great America sometime, but there are so many parks ahead of it on my list. You should definitely get to Six Flags Great America. I don't think the park has any "destination rollercoasters", but compared to other Six Flags parks, it looks and feels way more inviting. Also, the park has signs claiming it is the cleanest park in the world, and I don't know how much validity is in that statement, but compared to Great Adventures dirty and beat up parking lot, Great America definitely does feel nice and clean. 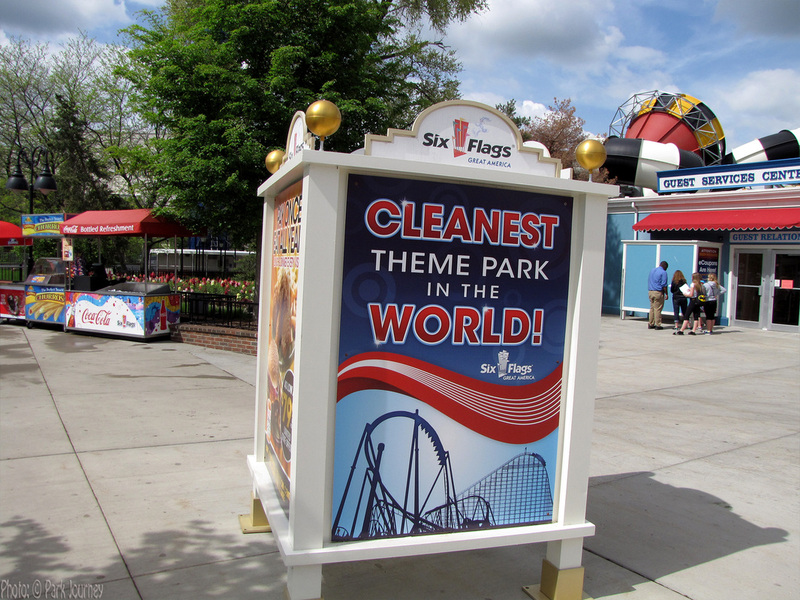 Every trip to Great Adventure I've had has been a "clean" experience other than the parking lot, and Six Flags Regular America (only way I can remember the two different parks) was spotless and shiny when I was there a few years ago. Maybe they're upping their game. Was just at Great Adventure and was surprised to see new black top in the parking lot. Of course they didn't black top the whole parking lot. Because they're waiting on the solar roof.